We use Kayako on-premise for our ticketing software to handle request and tickets. Kayako is fairly intuitive, and most users are able to do the majority of tasks we need them to. We find the on-premise solution to have the ability to be customized, which really is the biggest plus for making it fit how our workflow functions. Weaknesses are the ease of reporting, as you must be familiar with KQL to build complex reports. We have also felt like updates are a bit too few and in between. Interactions with Kayako customer service has been a challenge. The system itself can be glitchy with hard to pinpoint intermittent errors. Overall, the cost is very value friendly on a per/user basis, and it generally does what we need it to do. We use Kayako on-premise for our ticketing software to handle request and tickets. Kayako is fairly intuitive, and most users are able to do the majority of tasks we need them to. We find the on-premise solution to have the ability to be customized, which really is the biggest plus for making it fit how our workflow functions. 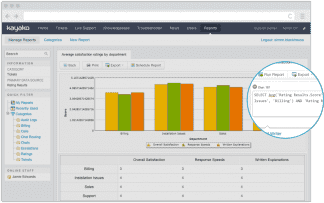 Weaknesses are the ease of reporting, as you must be familiar with KQL to build complex reports. We have also felt like updates are a bit too few and in between. Interactions with Kayako customer service has been a challenge. The system itself can be glitchy with hard to pinpoint intermittent errors. Overall, the cost is very value friendly on a per/user basis, and it generally does what we need it to do. Kayako was created in 2001 by Varun Shoor to better provide effective customer service to his own customers over the web. In time, the solution became the product, and the development team grew. Today, Kayako remains a solution dedicated to providing a streamlined and intuitive customer service platform for businesses of all sizes and industries. 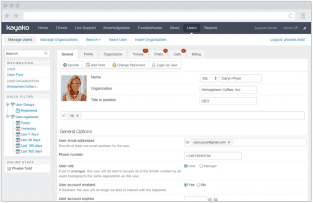 Kayako offers a visually-satisfying, organized user interface with plenty of ticketing options for customer service interactions over a multitude of channels. The most notable aspect of Kayako, on first use, is the level of immersion achieved by the integration of those channels into the ticketing ‘conversation’. Customers contacting you via tweets, emails, website live chat or by logging into your branded help center will have their messages – and in some cases, tracked behavior – organized into a timeline. The notion is to provide a contextual, continuous conversation per case until the issue is resolved. These conversations can include the support agents’ private notes in addition to the collaborators included with each plan. It’s a very effective, familiar messenger-like interface. 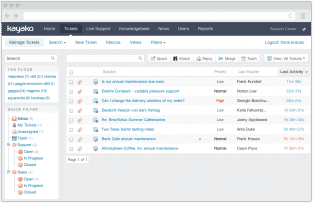 Each case has ticket properties on the right, which can be manually altered or automatically configured or updated through triggers and workflows. The support agent can send and save macros to respond to regular cases with pre-written templates. The internal messenger system, called Kayako Messenger, enables live conversations when your team is online and offline messages when they’re not; this works across devices, so agents can respond to customer issues, and vice versa, anytime, anywhere. It can be enabled on your help center and embedded in any other website with a bit of HTML code. Of Kayako’s features that coincide with their larger rivals, Kayako holds its own with a very well-designed system and array of features that perform the platform’s essential purpose – helpdesk ticketing. The lack of call functionality limits its appeal for businesses that seek granular insights on the performance of their customer service department or simply the ability to call or text their customers. With a bit of technical know-how, users can overcome the lack of built-in reporting or third-party integrations, but this requires a bit more oversight and management than platforms that handle it for you. 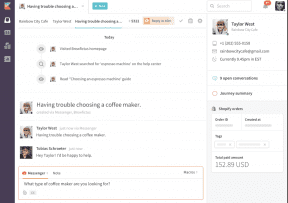 For businesses willing to make the effort, or whose use case doesn’t require many integrations, phone calls or the need for reports, Kayako is an effective platform with a very natural, intuitive customer service interface. It’s among the least cluttered and most immersive ticketing platforms around – achieved as much through effective design as through a somewhat limited scope in features. What Do You Think of Kayako?